Marijuana has for decades been a lot of things to a lot of people: sleep aid, pain reliever and recreational drug to name a few. Anymore, however, it’s also become a very effective tool for imprisoning young black and Latino men. Though whites are statistically more likely to dabble in pot than minorities, the racial discrepancies of marijuana busts are staggering. In New York City, for instance, minor marijuana arrests are down thanks to a Bloomberg-backed effort to give leeway to people in possession of small amounts of the drug. But of those who are arrested, often via the NYPD’s controversial stop-and-frisk program, nearly 80 percent are either black or Latino. 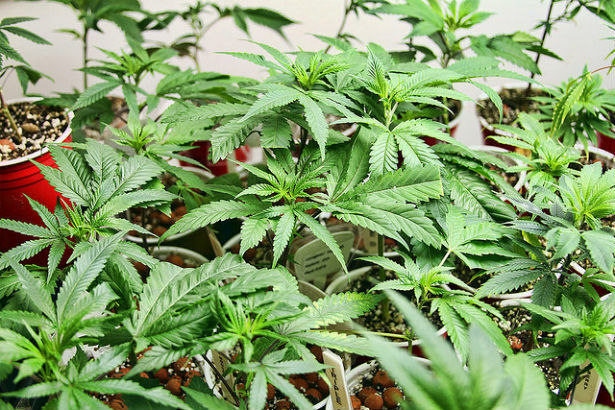 Similarly, in Chicago in 2011, 20,603 people were arrested for having a negligible amount of marijuana. One thousand of those Chicagoans were white, while 15,862 of them were black. In the six urban areas where [criminal justice professor Jon] Gettman found the highest rates of marijuana arrests, the handcuffs most often clamped black wrists. In Baltimore, Louisville, Omaha, Atlanta, and Syracuse and Buffalo in upstate New York, the arrest rate for black people exceeded 1 out of 65. In Atlanta, African Americans were 93 percent of those busted for pot in the last two years, according to figures obtained by TV station WSB. The city’s people are slightly more than half black. Black people are 88 percent of those busted in Baltimore, which is 64 percent black. In Omaha, Syracuse, and Buffalo, African Americans are slightly more than 10 percent of the population, and about half the people arrested. Prima facie, the prejudicial manner in which major American cities are arresting nonviolent pot users is wildly wrong. But it becomes an outright tragedy when one considers that it’s these kinds of minor arrests early in a low-income person’s life that end up derailing entire futures. A wealthy college kid who gets busted with a bong in his room is likely to be ultimately fine, what with a decent lawyer who can sweet-talk a judge about his client’s bright career prospects. Meanwhile, a low-income 19-year-old in Atlanta who gets arrested for having pot probably can’t afford a lawyer good and well-connected enough to help him wipe his record clean. That means that he’s got a pot charge burdening him, which makes a person ineligible for federal student loans and subsidized housing, and difficult to employ in a world gone crazy with online background checks. If the boy’s arrested again, and that’s a distinct possibility once he’s got a record, it’s likely his prior conviction will also ensure his next punishment is harsher than before. Blessedly, many cities are coming to their senses. Bloomberg, as I said before, is at least saying he wants to cut down on ticky-tack marijuana arrests in New York, and the Chicago City Counil ruled last month to allow cops to give tickets to people in possession of fifteen grams of pot or less rather than arresting them. In other words, we’re slowly improving, little by little, state by state. In the meantime, Americans need to understand that the war on marijuana isn’t a war on hippie stoners, and it never has been, despite the drug’s mythology. 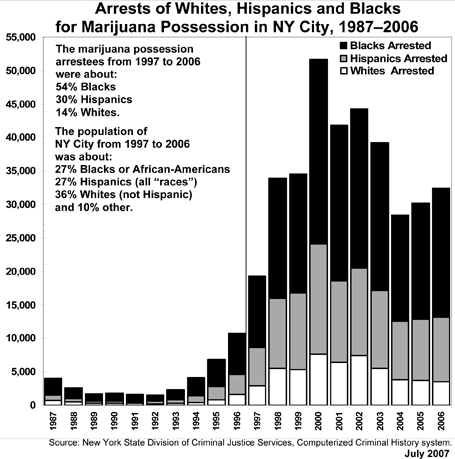 As with most of the drug war, the pot war is one being waged against young black and brown people. Even if you’ve never touched a joint a day in your life, you should consider that a major problem. One needn’t support weed to fight racism.